In 2003 the Massachusetts Army National Guard produced a video “Through a Soldier’s Eyes” documenting the history of Camp Edwards in the World War II era. As part of this project, interviews with local Veterans who had trained at Camp Edwards during this time were recorded. These memories are treasures we are pleased to be able to share here. Camp Edwards looks much different today from the place it was when these memories were made. The remarkable thing these stories bring home to us isn't what has changed from then and now; it is what remains the same. The fundamental commonality of experiences, the unique camaraderie formed, and life lessons learned live on at Camp Edwards today as soldiers continue to train here in preparation to serve their country. 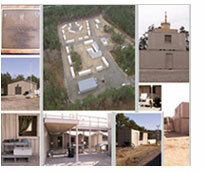 The Military Operations Urban Terrain site is dedicated to Major Jeffrey R. Calero from Queens Village, New York. Major Jeffrey R. Calero, 34, was fatally wounded when he encountered an IED in the course of conducting a dismounted route clearance of a “choke point” during a combat reconnaissance patrol and resupply convoy in the city of Kajaki while serving with ODA 2132 of Company C, 1st Battalion, 20th Special Forces Group (Airborne). He deployed in support of Operation Enduring Freedom in summer of 2007. This was his second deployment in support of Operation Enduring Freedom. Major Calero was born in Puerto Rico, and moved to Queens Village, N.Y., at the age of one. He graduated from Saint Francis Preparatory School in Queens, N.Y. where he excelled in football. Upon graduation he received a partial scholarship to attend Rensselaer Polytechnical Institute in Troy, N.Y. He enrolled in ROTC and upon graduating with a bachelor of science degree in mechanical engineering in 1995, he was commissioned as an infantry second lieutenant in the United States Army. As a civilian, Calero worked in New York City as a mechanical engineer. He was working towards earning his professional engineering license in an effort to start his own firm. A dedicated Soldier, Major Calero received numerous awards for his service, which included airborne training and service as an Army Ranger before he joined the Special Forces. After six years of active duty, which culminated in him receiving the coveted “Green Beret,” a distinction that members of the Army’s Special Forces unit receive – Major Calero joined the Army National Guard. His father said that Jeffrey had turned down two opportunities for promotion to stay with his unit. The Army promoted him posthumously to the rank of major. The Tactical Training Base is dedicated to Sergeant Michael J. Kelley, 26, of Scituate, Massachusetts. Sergeant Kelley died June 8, 2005, in Shkin, Afghanistan, when his helicopter landing zone came under enemy fire. Sergeant Kelley was assigned to the Army National Guard’s Battery E (Target Acquisition) 101st Field Artillery, Rehoboth, Massachusetts. Fire Base Shkin is a mud fortress that resembles the Alamo. It is located in one of the most dangerous places in Afghanistan in Paktika province. Shkin fire base is located approximately four miles from the Pakistan border at an elevation of 7800ft. The Fire Base is located in the direct path of a well-used enemy travel corridor between the two countries. Sergeant Kelley graduated from Scituate High School in 1997. Upon graduation, Sergeant Kelley joined the Massachusetts Army National Guard in an effort to attend college and gain skills to later apply in the civilian aviation industry. After observing many of his comrades serve overseas in support of the Global War on Terrorism, Sergeant Kelley volunteered to deploy to Afghanistan with his unit, Battery E.
“He was an intelligent, eager and very capable Soldier. I remember talking with him about his pending deployment and how he had transferred into the target acquisition battery so he could do his part. I admired his courage and his willingness to step up and do what he felt strongly about. He was a fine man and an excellent Soldier who epitomized all the reasons that we all wear the uniform with pride,” said CW4 Michael Sellars. Sergeant Kelley earned several awards and decorations including the Purple Heart, Bronze Star Medal, Army Good Conduct Medal, National Defense Service Medal, Afghanistan Campaign Medal, Armed Forces Reserve Medal with “M” Device, Global War on Terrorism Service Medal, Army Service Ribbon and Overseas Service Ribbon. In 1931, the Adjutant-General of Massachusetts appointed a board of six Army National Guard officers to find a new campsite, as Camp Devens was deemed too small for required training. In 1933, Cape Cod was initially identified as a viable area for the new camp, to mixed reaction from the local communities. Feasibility assessments, and letters for and against the proposed military reservation, continued to be presented to the Commonwealth and the War Department through April 1935, when then Governor James Curley signed a bill to appropriate funds for the purchase of a campsite and to establish a Military Reservation Commission. In September of that year, the War Department approved acquisition (purchase or lease) of up to 200,000 acres of land in Cape Cod for military training. See links at right for additional JBCC/Camp Edwards history. 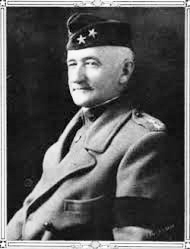 In July 1938, then Governor Charles Hurley dedicated Camp Edwards, naming it in honor of Major General Clarence Ransom Edwards (January 1, 1859 – February 14, 1931), former commander of the 26th (Yankee) Infantry Division. He was born in Ohio and accepted an appointment to West Point, graduating in 1883. He was commander of the Guard for President Garfield's tomb at Fort Porter and while there got married. He fought in the Spanish-American War, Philippine-American War and World War I. He returned to the United States and was assigned to various posts until he retired from the Army after 40 years service in 1922. 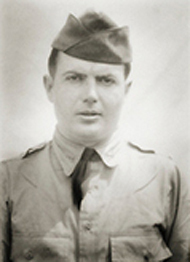 Otis Air National Guard Base is named for pilot, flight surgeon, and eminent Boston City Hospital surgeon, Lt. Frank "Jesse" Otis, a member of the 101st Observation Squadron who was killed on Jan. 11, 1937 when his Douglas O-46A crashed while on a cross-country training mission. In 1938, the landing field area at Camp Edwards was named Otis Field in memory of the Boston flying physician. Ten years later the base was renamed Otis Air Force Base in his honor. Until 1973, it was the largest Aerospace Defense Command base in the world and is the only base named for a doctor."